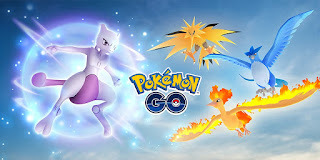 “First, starting September 13 at 1:00 P.M. (PDT), Trainers all over the world will be able to encounter three Legendary Pokémon originally discovered in the Kanto region!. Articuno, Zapdos, and Moltres will appear in Raid Battles until September 20. And if you’re lucky, you may be able to encounter their Shiny forms! Also, Pokémon originally discovered in the Kanto region will appear more frequently all over the world and show up more frequently in Raid Battles until September 30! And there’s more! On September 20 at 1:00 P.M. (PDT), Mewtwo will come to Raid Battles for the first time ever! Mewtwo has previously only been available to Trainers invited to EX Raids, but now all Trainers will be able to challenge the Legendary Psychic-type Pokémon until October 23 at 1:00 P.M. (PDT). So prepare yourself, and don’t miss your opportunity to encounter this powerful Pokémon before it disappears!